"Tithe" is such an emotionally charged word, it's hard to discuss it without stirring the pot (see Tithing is Still a Touchy Subject and Why is the Tithe a Tenth?). So, I will do my best to avoid stepping on any land mines. I do, however, want to share a little of what I was asked to share yesterday during our church's offering time. Abraham and his crew, having just returned from battle, are met by Melchisedec (to use the King James spelling), King of Salem, who blesses Abraham. In response, Abraham gives Melchisedec a tenth of all. It's been a while, but many of you know that a primary focus of this blog is the ancient Hebrew alphabet and the stories told thereby within Biblical words. For example, see Hebrew-The Divine Language. 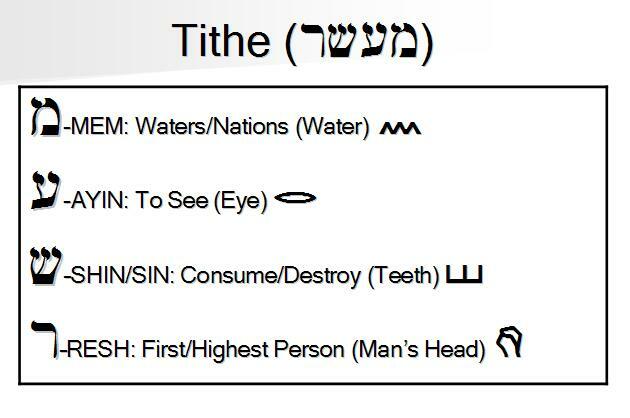 The story told by the ancient Hebrew pictographs that make up the word "tithe" is equally remarkable. A quick recap, the ancient Hebrew alphabet was made up of pictographs, each representing a letter, a number, and a symbolic meaning (I just recently heard that each represented a color as well, but it was news to me, and I can't say much more about that). The Hebrew word for "tithe" is ma' asser, and please forgive my transliteration. In Hebrew, ma' asser is spelled by the Hebrew letters MEM (the equivalent of our letter "M"), which is pictured as waves of water and symbolically means nations or waters; AYIN (perhaps our letter "O" or "E"), pictured as an eye and meaning to see; SHIN/SIN ("Sh" or "S"), pictured as two teeth, meaning to consume or destroy; and RESH ("R"), pictured as a man's head, meaning the first or highest person. God promised Abraham he would make of him a great nation. He then asks Abraham to sacrifice his son. Thus, "tithe" is the picture of Abraham, the great NATION, SEEing the DESTRUCTION of the FIRST son (Isaac was the son of promise as far as God was concerned). However, "tithe" also represents the act reciprocated by God, in part, because of Abraham's obedience. We now know that the NATIONS have SEEN the DESTRUCTION of God's FIRST SON. Regardless of your theology regarding the tithe, Abraham tithed to Melchisedec after being blessed by him, and his great-grandson got credit for it; and his descendants received tithes from the rest of the nation. I can't think of a better reason to tithe than simply because we have been blessed by God in his tithe to us: the sacrifice of His son. How better to leave a lasting legacy for your great-grandchildren's descendants.